In 1933 the famous English novelist H.G. 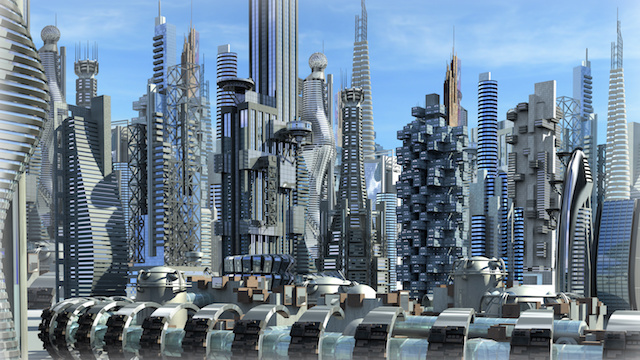 Wells published “The Shape of Things to Come.” It was Well’s vision of what the future might look like. He correctly predicted a future world war, followed by chaos and a return to stability under a new world order. The new world order was called the “Dictatorship of the Air.” It was made up of technologically advanced airmen who controlled all transportation, restoring civilization after the chaos caused by “rampant nationalism.” In the book the new world order eventually creates a worldwide utopia. There’s only one problem. The “Dictatorship of the Air’s” utopia comes at a high price. National borders are erased and made illegal. Religion is outlawed. In fact, to make sure that religion is finished, the “Dictatorship” gasses the Vatican, crushes the Catholic church in Italy, and declares Christianity illegal. Ireland is the last holdout, but it is eventually crushed. The “Modern State” takes over education, moulding future generations to their way of thinking by indoctrinating the young. The world’s language becomes “Basic English” and other languages fade away. If someone opposes the world wide “Modern State” ( Yes, that’s actually what they call it) they are murdered or given the chance to take a poison pill. The “Modern State’s ” ideology is based on rationalism and science. No deviation from these two beliefs is tolerated. Eventually, a classless society is established. Since the state’s education is so advanced, everyone becomes a kind of upper middle class, highly educated genius. Congratulations. The new utopia has arrived. Do elements of this seem familiar? Although Wells denied it, many parts of his vision resemble Marxism. Other parts resemble the dictatorship in George Orwell’s 1984 or Aldous Huxley’s Brave New World. Wells apparently saw this as the only way out of mankind’s ills after the Great War and the depression. To those of us who love freedom, his vision is decidedly depressing, but what is even more so is the need to ask an important question. Is his vision of the future coming true? Our ridiculously promiscuous and liberal educational system, is now forcing vile and objectionable sexual lifestyles on our children.The state approves and directs it. Those of us who hold faith based beliefs are silenced or punished, either through fines or jail terms. We are being forced to sign documents, “attestations” that violate our religious principles, and if we don’t, our benefits are being taken from us. The “Modern State’s” doctrines, supported by vague terms like “diversity” and “inclusion” define what we may or may not do. These ideologies are now dictating the shape of our world to us, and it is full of concepts that condone the vilest and most contemptible delusions. Unfortunately, we are caught in the middle of it. There is a “Great Revolt” brewing against it. That’s good news, and we are all part of it, but a more violent future clash is all but inevitable. Is Well’s “The Shape of Things to Come” our future? That will depend on each of us, and our willingness to fight the tyrannical “utopia” he had in mind.